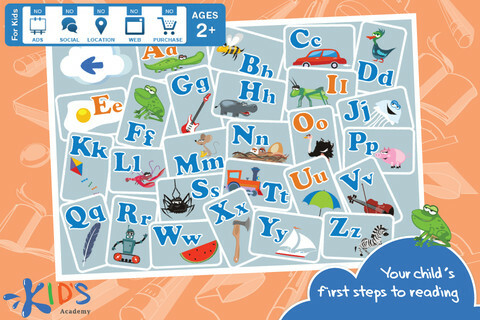 ABCDEFGH...I love this next application for teaching the alphabet to my students! 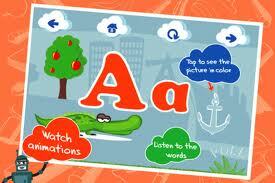 Interactive ABC is interactive and animated with fun visuals for each letter of the alphabet. The application has received a major update (and a new name) since I last reviewed it on iTunes, and it is even better than before! 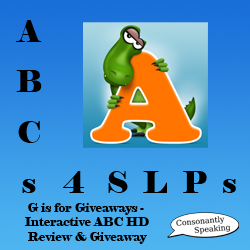 Continue reading this post for my review of Interactive ABC as well as a giveaway of the application! The main page of the application shows different users and their pictures as well as a light switch for parents to flip, the start button to begin the application with the student selected, and upcoming application(s). Slide the light switch to access the parent zone where you can view and edit different profiles, check student progress, change settings, and view information about the developer, how to use the application, and links to social media/rate the application in iTunes. To create a new profile within the parent area, press the "New Profile" button. Then, add a picture and enter a name via the keyboard. Finally, press the "Done" button. View a students' progress in the parent area by pressing the students' profile and pressing the "Progress" button. A chart will show each letter of the alphabet, how many times the letter was played, and which letter was last played. You can turn music and sound on/off via switches on the "Settings" menu. You can also choose between male and female voices to be used in the application (or both!). Settings can also be accessed during application play by swiping up near the "Pull" text on the application page. Press the student profile on the main page, then press the "Start" button. Next, choose an image/letter to begin the interactive portion of the application. The letter (upper and lowercase) will appear on the screen and it will be stated aloud. Various elements on the page will flash indicating where to press for more interactive elements. Press on a shaded image to cause it to appear in color as well as change the letters to a word with the letter at the beginning of the word. The first letter of the word will remain blue with the remainder of the word appearing in red. 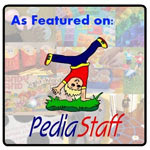 An animation will also play along with the word/image being displayed. To move to the next or previous letters, press the arrow buttons on either side of the top of the application. To re-play the animations for a certain letter, press the arrow in a circle motion button at the top of the application. Finally, press the "Home" button to see the rest of the letters and choose a new letter. Any letters already played during a session will appear on the card associated with the letter. Music played in the background, if on, is a version of the alphabet song. 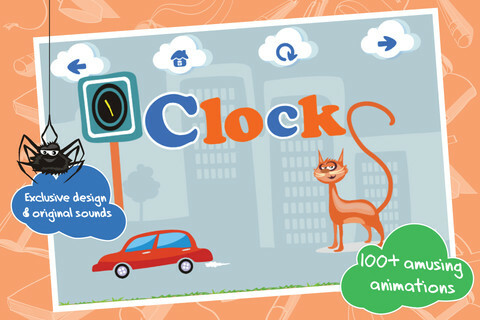 The application is interactive and contains animations of various images for each letter. There are at least 2-3 images of words associated with each letter on a page. Words will appear with the given letter as an image is pressed and animated. You can view a students' progress of application play via the parents menu. You can turn on and off music/sound if it is distracting to students. Letters and words are narrated aloud for those students who cannot read/have difficulty with letter identification. Of course I would love to see more animations/images/words for each letter; however, I am not sure how to do so without cluttering the application screen. So, I am not sure if this is possible/necessary. RtI - Use this application for letter identification and beginning letter sounds. Articulation - Choose the students' speech sound to have the student state the different words with his or her speech sounds. Have students think of as many words as they can with their sound. Have students state a sentence based on the words on the screen! Receptive Language - Have students name as many words as they can with a given letter. They can also describe or compare/contrast various objects seen for each letter of the application. Expressive Language - Students can create a story based on all three words on the letter page. Interactive ABC HD is available for the iPod Touch, iPhone, and iPad for $1.99. Try it out for free with the Lite version of the application! 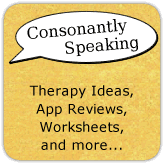 Consonantly Speaking was given three application codes to give away along with this review. No other form of compensation was given. Enter below for your chance to win one of three application codes!